Tammie Fails went to heaven to join her dad on April 21st. She spent her last day on earth with her whole family by her side at home. Tammie bravely fought for her life for the last 15 years. Paralysis, blindness, and pulmonary disease plagued her yet her belief in God pulled her through. Her love of sports and especially the Cleveland Indians and Cavaliers was well known. She also followed the OSU Buckeyes. She loved music. In high-school she was in plays and the special performing song and dance group. As a softball player she could "hit the stitching off the ball". Her former occupations were a consultant for Temporary Corporate Housing and a party planner in Cincinnati, OH. 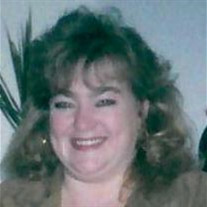 Tammie was a loving daughter, sister and aunt. She will be deeply missed by her family for her positivity and love of life. She is preceded in death by her father, Harry Fails Jr.; special aunt, Gina Delmore; her grandparents, Laura and Harry Fails, Sr.; and Ralph and Lilyan Reo. We wish to thank her aides and special friends: Aunt Bonnie, Tracy Gordon, Ashley Burkey, Nikki Ketler, Bill Jones, Niki Di Cola and the Alliance ICU (especially nurses Paula and Ashley). Also thanks to Alliance Hospice and Dr. Mark Shivers for their special devotion. Survivors include her mother, Rosemary Fails; her sister, Diana Fails (Jerry Hammerton; her brother, Tim Fails (Michelle Fails); sister, Mary Beth (Cliff Smith); nieces and nephews Kayla (Brock), Bree, AJ, Keira, Nathan and Ally; and great-nephew Blake. On Tuesday, April 24, 2018, visitation will be held beginning at 10:00 a.m. at St. Joseph's Catholic Church with a Memorial Mass at Noon. Arrangements are with Cassaday-Turkle-Christian Funeral Home, 75 S. Union Ave., Alliance, Ohio 44601.